At Unclutterer, we’re taking the day off from work to honor those who have fallen in service to our country and those who have passed before us. We’ll see you back here tomorrow for regularly scheduled content! Do you have a big ‘But …’? So what is your big “But …”? What is keeping you from letting go of your clutter? The next time you catch yourself making an excuse, think about what you’re saying. Is your excuse warranted, or are you just voicing a fear of change? Similar to a photo album, the Card Wheel has clear pockets that you can slip paper cards into and organize the cards by color tabs. My family lives in a modern 4 bedroom house with a 2 car garage, finished basement and shed. We have deep closets, shelving, and storage rooms galore. My husband and I and 3 kids are on a mission to reduce our possessions yet we have so much storage there are little bits here and there. Some cabinets are just plain empty. I’m still left with the feeling of clutter and disorganization since everything is spread out. I’m not sure what I own or where it all is! What would you suggest to consolidate things and keep my belongings under control? Thank you. Too much storage? Annette, I have to tell you, it’s not often I come across people in your situation. However, too much storage can be a problem, especially since our human tendency is to fill up the space we have. Fighting this natural desire and keeping your family from wanting to fill it up, too, will likely be a struggle as long as you’re in this home. In the world of Make Believe, you would sell this house and downsize to one that more appropriately meets your family’s needs. However, this is the U.S. in 2010 when the housing market is in the toilet, and not Make Believe. So, just tilt your head back, have a good chuckle, and then continue reading for some more serious advice. First, when organizing the things you decide to keep, group like items with like items. This may require pulling everything you currently have in storage and sorting it out on your living room floor. Extra batteries should be grouped together, towels together, and so on and so forth. Once you have items grouped together, return them to the storage place physically closest to the place where they are used. Coffee mugs should be stored next to the coffee maker, toilet paper in bathroom closets, lawn mower in the garage or a shed, and sheets in their appropriate bedroom closet. 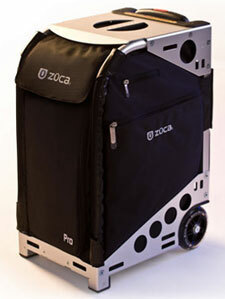 Within the specific storage space, put those things you access most often on shelves between your knees and shoulders. Items you access less often can go on shelves below your knees and above your shoulders. Obviously, put heavier items on those lower shelves and lighter items on the highest shelves. Only use your attic and basement storage space for things you access just once a year or less — holiday decorations, for instance. Make an inventory of what you have stored in these areas and post it on the back of the door or next to the light switch in these areas. Since you shouldn’t be storing much of anything in these spaces, these inventories won’t take you long to create. By storing things in your home closest to where you use them the most often, you shouldn’t have much difficulty finding things when you need them. You can always create inventories for closets that store regular items if you want. And, since you have kids, you might want to label the lips of shelves so little helpers can learn where things are stored. Thank you, Annette, for submitting your question for our Ask Unclutterer column. Good luck organizing your storage spaces! 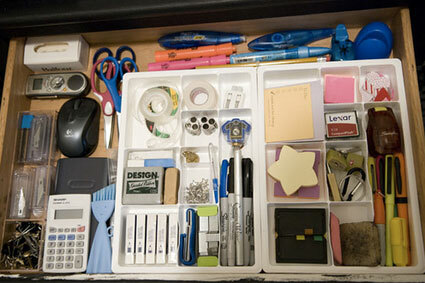 I am one of those odd people who could waste hours a day looking at pictures of well-organized desk drawers. They make me incredibly happy, and this one is spectacular. There is place for everything, and everything is in its place. It’s serene. Blissful. Calming. And, what is even better, there are “before” pictures on Maureen’s blog. It’s a makeover drawer! Thank you, Maureen, for submitting your terrific drawer to our Flickr pool. The fronts of my kitchen cabinets are mostly glass, so even my plates and cups are on display. Since I follow the red velvet rope test for my closet, I’m fine if people see my clothes, although I don’t know why they would want to look at them. My office supplies are stored in a closet, but the closet has made so many appearances on Unclutterer that people actually ask to see it when they come to visit. For a possession not to be on display in my home, it must meet one of four strict standards: security, safety, efficiency, and anti-distraction. Security: If having an item on display risks your personal security, then by all means keep it stored out of sight. Your social security information, your passport, and other sensitive data is more secure if it’s difficult for strangers to find in your home. Safety: Cleaning supplies, weapons, and medications should be stored in such a way as to make it difficult for children and visitors to accidentally poison or injure themselves. If you or someone in your home has a mobility disability, keeping things stored away might also help reduce injuries. Efficiency: Storing tools in a toolbox is a good example of the efficiency factor — it is more efficient to carry a single toolbox to a project than to take each tool off a wall and carry it individually to a project. It’s efficient to store pots and pans in a kitchen cupboard because it keeps dust, bacteria, and grease from collecting on the items. Anti-distraction: This is a tricky standard and should be used carefully. It would be easy to justify storing every note you wrote in middle school in a box in your attic because displaying them would be a visual distraction. But, if you would be embarrassed to have any of the notes on display, you would be abusing the anti-distraction standard. The anti-distraction standard is for when an object being out on display distracts you the same way clutter does. Office supplies are better stored in a drawer if they infringe on your work surface and draw your attention away from your work. Your goal at your desk is to work, so your desk surface should be clear of all distractions. Another good standard is the embarrassment factor: If I would be embarrassed for someone to know I owned something, it’s clutter and I get rid of it. Socks with holes in them and stained t-shirts become dust rags, for example. If an object is not on display or stored because of one of the above standards, I recycle, trash, sell, or give it away. Do you use standards or guidelines to help you decide what objects in your home belong in storage instead of being on display? I’ll admit that my standards are more strict than other people’s, but they work for my family and our small space. These standards also help us keep clutter to a minimum because if I don’t think an object is worthy of being on display (even if I choose not to display the item), I’ll get rid of it. Fewer possessions result in fewer things to clean and maintain — and I greatly value these benefits of an uncluttered life. I’m not a huge fan of cherries (unless they’re candied and in the middle of a giant dollop of chocolate), so I don’t own a cherry pitter. 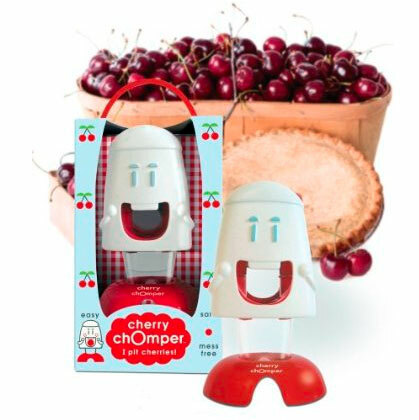 However, if you’re a fan of cherries, I hear the workhorse cherry pitter can be a small and useful single-task device (similar to a garlic press). One of the reviews on Amazon is titled: “A Messy Waste of Time — Works Like it’s Part of the Federal Government.” I don’t know if that headline is accurate, but it certainly made me laugh. Thanks, Alison, for bringing this big head Cherry Chomper unitasker to our attention! If you don’t have a closet near the front door to your home, a free-standing coat rack might be a good way to keep your summer jackets from ending up on the back of every couch and chair in the adjacent room. 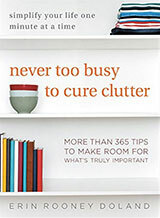 An essential component to maintaining an uncluttered life is having routines in place that keep the clutter out of your home and office and the self control and diligence to systematically complete the routines. DIY knife block looks just as good at a fraction of the cost. How to deal with the cable clutter caused by portable device chargers. The Canadian newspaper The Globe and Mail ran an article last week about artist and writer Douglas Coupland. Irrespective of if you are familiar with Coupland’s work, “A Generation X pack rat forfeits his treasures” is a thought-provoking article that explores the fanfare surrounding Coupland’s recent donation of his home’s vast collection of clutter to a university’s library. On Thursday, the library at the University of British Columbia announced it had acquired Mr. Coupland’s papers, a voluminous and fascinating collection now available to researchers. Among the treasures is the first draft of the novel Generation X, the title of which became a catchphrase for those who, like the 48-year-old author, were born in the shadow of self-obsessed baby boomers. The opening page of the draft, written in tidy cursive in blue ink, includes the author’s annotations and revisions. “I was feeling like I was on that TV show Hoarders,” Mr. Coupland said Thursday. “The excuses people gave for keeping an old empty Styrofoam cup were the same reasons I was using for holding on to stuff. It was a wake-up moment. The library received the archive 18 months ago after several years of gentle entreaties and, finally, serious negotiations. Reality is that the majority of us and our things will end up in landfills and recycling centers. We are not Douglas Couplands. No one is interested in our clutter. We do not need to be curators or purveyors of stuff for future generations. But articles like this one seem to promote collecting or hoarding random things on the chance that we might become famous and that someone might be interested in our stuff and they might pay us for it. What do you think? What came to your mind while you were reading this article? Were you as conflicted about the message of the article as I was? I’m interested in reading your reactions to this thought-provoking piece, and I’m glad Coupland is now living clutter free. Today we welcome guest post writer Chaya Goodman, editor of the website Networx. Chaya’s website provides information on how to fix, renovate, and decorate your house. 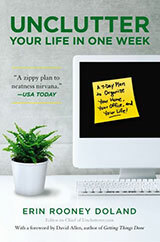 You can’t organize your life all at once, nor can you get to the root of your organizational problems in one fell swoop. Start small. First things first and last things last. I have a friend who can’t seem to hold down a job or keep a space clean, largely because she decided a long time ago that the root of her problems is that she can’t find the right community to live in. Thus, she has spent years packing and unpacking her belongings, living out of boxes, and losing important items and holding onto stuff that she “might need one day.” If you can’t hold down a job or keep a room clean, then work on getting up and going to work every day — don’t worry about why you can’t do it, focus on doing it. Tidy up your house for 10 minutes every night. Don’t skip town. Eventually, the problem and its root might just disappear. Accept that work, especially house cleaning and organization, can be boring. You might have to spend time doing tasks that you think are below your intellect. If you believe that you are too busy, intelligent, or talented for grunt work, your space is probably going to be a disaster area. I know this first hand. I used to write poems instead of doing dishes, or get so busy with community projects that I couldn’t find time to put away my laundry. Believing that you’re too smart for house work is faulty logic and egotism. Do I find folding laundry boring? Yes. Do I sometimes wish I could sit and write instead of mopping my floor? Yes. However, footwork is a means to an end. I accept that I get to read books and write stories after I’ve tidied up my apartment. Having a clean house allows me to think more clearly than ever, and washing the dishes is a great distraction-free time to brainstorm visionary ideas. The biggest bug behind procrastination is making plans that are too grandiose. I used to write up these elaborate meal plans and organizational plans that always bombed, because they were far too ambitious. One of the biggest revelations I’ve had in maintaining a healthy diet and reducing the number of dishes I have to wash is that I essentially gave up on cooking during the week. I keep a large plastic bowl at work, and a sharp vegetable knife. Twice a day, I take 5 minutes to rinse off a few vegetables and throw together a big salad in my plastic bowl. For protein, I throw in some nuts or beans or sprouts, and I eat a couple pieces of sprouted bread from the health food store. If I were limiting my definition of healthy eating to making elaborate macrobiotic meals, I’d be fat and unhealthy, and I’d have dishes piled up in the sink. I found a way to eat my vegetables in 10 minutes a day. Is it a perfect diet? No, but it works. I’ve noticed that the cycle of slacking for me goes like this: 1. Taking on way too many projects (organizational or otherwise), to compensate for having slacked off; 2. Trying to do all the tasks using poor time management skills; 3. Failing at fulfilling responsibilities; 4. Giving up hope; 5. Slacking. When tasks start piling up, do not touch the dust of taking them on all it once. Be honest with yourself — you’re not a superhero who can stop time. Instead, make a list and deal first with the task with the biggest penalty for slacking. For example, renewing my driver’s license has the biggest financial risk associated with it, so I decided to undertake it before putting away my laundry. The best way to tackle responsibilities is to multitask. You can master time management by multitasking. For instance, I like to throw dinner parties, but my minimalist kitchen only has one burner and a toaster oven, and I only have one morning a week available for house cleaning. When I throw a dinner party, my plan might look like this: On the morning before a dinner party, I start by writing a list of tasks. Next, I organize what jobs I can do concurrently. First I cook the rice. While the rice cooks, I sort my laundry into piles and chop vegetables for stew. Next, I put the stew on the burner to cook. While the stew cooks, I take my laundry to the Laundromat on my block. Once my laundry is out of the house, I sweep and mop the floor. Then, I wipe down my baseboards and windowsill. I take the stew off the burner and start making salads. I set the table. Eventually, you will be able to gauge how long particular tasks take, and you’ll be able to do several actions at the same time. Essentially, what I have learned over the past year of staying organized and living efficiently is that the best safeguard against slacking off and procrastinating is doing the task now, whatever it is. I often remind myself that whatever chore I want to put off will be harder later. The anxiety that procrastination causes is much harder than just bucking up and doing it now. Heather Poole, a flight attendant interviewed for the article, can fit more than 40 pieces of clothes and two pairs of shoes into her carry-on bag. She primarily rolls her clothing, but also “wraps” her nice clothes around her rolled casual items (which, are mostly 50-50 cotton-polyester). Also, don’t miss the 12 image slide show that accompanies the article with step-by-step photographs showing how Heather Poole fits it all in her bag. It shows how-to instructions for even packing clothes you don’t want wrinkled. What do you do to keep your PC clean? Let’s fill the comments with ideas and suggestions to help all of our PC readers. What is the clutter in your life? How would your life be different if you chose to get rid of the distractions? Author Mark Coggins shows us that four cabinet doors can create a barrier between your work and personal lives. Everyone begins life as a messy, disorganized, lump of a baby. No one is born in a starched shirt and polished shoes with a day planner in one hand and a vacuum cleaner in the other. G&S Design has a nice selection of common kitchen tools that compact down into a more convenient size that makes storing them a little easier. A recipe notebook can help to restore order in your kitchen. Avoid having a constant laundry mess by having fewer clothes in your closet.